It’s not over until the fat lady sings,…or the chairlifts close, or the last patches of snow turn the ground to mud. Sure, these past two winters in New England have been unusual–with hardly any snow to speak of and the mountain resorts on the brink of folding–but just because we don’t have snow on our Boston-area yards, and temps have been at record February highs, there is still plenty of snow to be found up north. 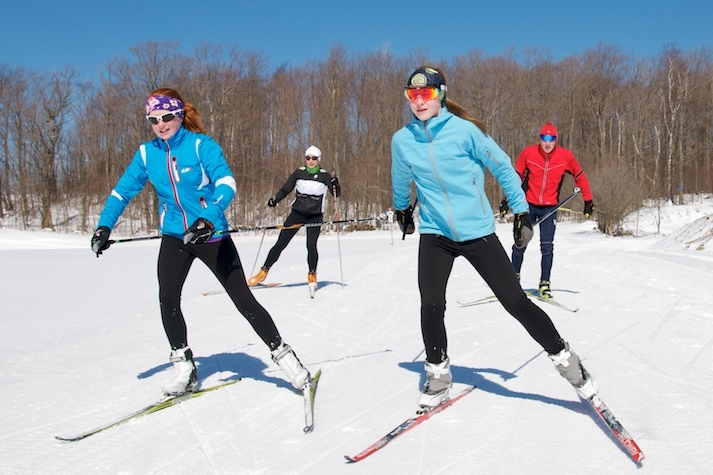 Skiing can be an excellent choice of exercise for all ages and all types of athletes, or just anyone who wants to get outside. It’s a fabulous cross-training activity, engaging each of the essential components for a healthy strong body, and proven to be more effective than jogging. Studies have shown that Cyclists use 40% of their total muscle mass to ride, runners 60% to jog and cross-country skiers 80%. This is double the energy cost of cycling, which has been theorized to be mostly due to the added dynamic use of arms and upper trunk. There’s no reason to feel that exercise must move indoors when cross country (XC) skiing is available. The sport has expanded from original Nordic track skiing to include Back Country (BC) skiing (with metal edges) for the explorer, and Skate Skiing for the most intense workouts. All that is needed are a few inches of snow to get out there and make your own tracks. It’s a wonderful way to “walk” the dog, or simply continue your marathon training when the roads are too slick, while also taking advantage of a gentler impact on your legs and trunk. XC skiing depends upon your own locomotion rather than a chairlift and gravity. No, the speeds and adrenaline rush are typically not as thrilling as alpine (downhill) skiing, but most admit that the XC-skiing workout is greater than alpine. For most of my life I poo-pooed the idea of sissy cross-country skiing. I never thought it would be challenging, and the idea reminded me of the monotony of running on a track or treadmill. Until I discovered BC-skiing I was for many decades one of those snobby “downhill-only” skiers, never willing to considering the idea of XC-skiing. Who wanted to ski in tracks, using someone’s already determined path, having to follow their route, perpetually going in loops? That would be like being an electric car or train just sliding along, hardly exercising at all, right? It was the thrill of the downhill speed, the challenge of executing a great slalom run, cutting in your line, and pushing the envelope that was the adrenaline rush I longed for. I’ve always enjoyed sports, and skiing was my favorite way to both adventure outdoors, to get into the wilderness, to fully experience the beauty of winter, and to get some great exercise. To top it off, it’s one of the best way of cross-training. Cross-training truly means hitting the 5 vital components that define muscles, and moving in all directions. Every muscle has an optimal power, flexibility, speed, endurance, and coordination (or balance) for it’s best performance. Play Fun Sports Every Chance is a simple acronym phrase to remember these categories. Simply add moving forward, backwards, sideways and twisting and all the bases are covered. 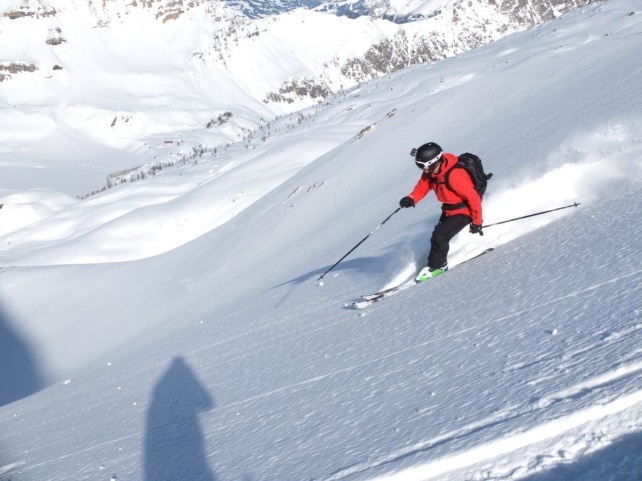 We certainly use our lateral and rotational muscles to push for acceleration and for torque, all the while working hard to balance in each method of skiing. Skate skiing is another animal altogether. A relatively new invention, it has become the epitome of intense workouts on snow. It’s more of a sprint, than a marathon, though for the more elite athlete it’s both. Not having too much “flat ice” access in NE, skate skiing is the next best thing to Apollo Ono and speed skating. However, special tracks and groomed fields or trails are required for the narrow, near blade skis donned by it’s enthusiasts. Skate skiing is very much what it sounds like, thus requiring the skills and balance that skating on ice requires, although you do get to use your hands! It’s a powerfully challenging aerobic exercise when you have less time for a workout. Year round I yearn to get outside for my exercise, to breath the fresh air, and see something different every day. If you’re lucky enough to be near some woodlands, it’s free and convenient, the same benefits why so many have taken to running. So for now, until the roads are dry and swept, and while it’s still officially winter, I’ll stick to my latest passion of XC-skiing every day there’s snow! And lastly, it has been reported to be a tremendous training benefit if you want to improve your running times!